A Kenyan Pastor has declared war on the kingdom of darkness who brought down his airplane while heading to Jerusalem using an artificial wings he created on the instruction of God who invited him in the dream. According to Standard News, Pastor Nwanga Gwranja told his followers at The Labourers Assembly Church in Bomet County Kenya during his Sunday Sermon that God invited him to Jerusalem in the dream. According to residents of Singowet ward in Kenya, Pastor Gwranja who predicted the second coming of Jesus on several occasions performed a stunt he has never performed shortly after he went round his village to announce his departure to Jerusalem. 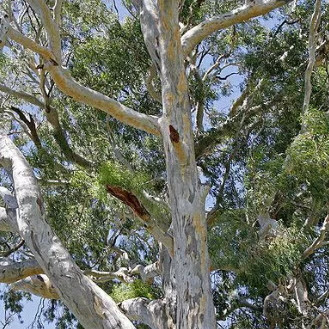 Shortly before he ended his sermon this past Sunday, he announced his departure spot, a tall Eucalyptus tree to his church members and village residents. He invited them to come and bid him farewell. His followers were shocked to see him tie an improvised wings made of polythene bags and rags to his shoulders. He soon climbed the tall Eucalyptus tree to begin his onward journey to Jerusalem as a huge crowd watched in disbelief. When the crowd noticed Pastor Gwranja might commit suicide, they informed the village Chief who in turn called police and ambulances for emergency rescue. His close friend, choir master convinced him to abandon his flight to Jerusalem and climb down from the tall tree but he ignored his request insisting that he must fly to Jerusalem. He once more inspected the rags and polythene bags he attached to his shoulder before embarking on his flight. Elders even tried to convince the adamant Pastor to come down and receive their blessings before taking off, but he rebuked them saying God was showing him the elders burning in hell for trying to stop him. Shortly before he took off, women and children who feared for the Pastor’s life were seen crying but that didn’t deter him. In their last attempt to rescue him from the grip of death, the elders of the village ordered a man to climb the tree and get him down. When Gwranja the wonder pastor noticed that the man was almost catching up with him, he spread his wings and took a plunge. He came tumbling down with a thud, and immediately began wailing, asking for help. His legs were broken, his nose bleeding before he eventually passed out. He was rushed to the hospital where he is expected to recover. Even in his condition, he still insisted that the kingdom of darkness were the ones who crashed his artificial wing. He promised concerned church members who visited him on his hospital bed that he will honour God’s invitation to Jerusalem after recovery. Are you not see his name? Gwranja, ganja. He have smoke ganja over dose. Fake igbo wey he buy for bush. Nonsens. He want to fly to Jerusalem. He sabi road? Many pipul are use many style to mad o. Some pipuls are speak only English when they are mad. Some pipuls are dance. Some pipuls are sing nonsens song. Some pipuls are laff up and down. Some pipuls are shout. But I never see pipuls weyris use fly to mad. Na orijinal madment be this o.
ha ha haaaaaaa. oh Bench, my ribs. 100 % of the so called men of God allias Pastors who see Vision and perform miracles are suffering from psychiatric disorder called psychosis. The man is mentally sich and should been in psychiatric Hospital. But the fellowers are ignorant and gullible. True talk. You can compare some followers of these pastors to followers of Donald Trump. No mater what the trumpet says they agree. There are certain things which will never change…and as they say, stupidity is a fundamental human right. Thanks, @Bench for that spectrum of insanity. Paranoia, schizophrenia, bipolar disorder and different issues of the mind are made manifest through religion and the acts of ‘miracles’ and many other absurdities. It is a pity. Even witches who are said to fly via brooms in the western fairy tales are less ridiculous. He did not even think of air space rights and landing fees if he got to his destination.What about the birds and other avian creatures whose arena he would be encroaching upon-will they be accommodating and gracious enough to allow this? The backwardness in Africa is taking its toll on most people.May God help us, especially people like those who actually followed him to the take-off site, watch him take the contraption and attempt to embark on the foolhardy activity. It will be well. That’s the result of over confidence with satanic calling….and what baffles me is people will still be following him as their papa or pastor after this. This is a mental issue and must be treated seriously. This is the highest order of madness. Some gullible members of his church will believe him. I doubt how many female members of his church he has bedded. ???????????????? lorrrrd have mercy. Who is this pastor for christ sake? This is soooo funny for real. Chai, this world has come to an end oo! This mad man is still tslking about flying to jerusalem again after crash landing? Na wahoo! Insanity. He should be thankful he didn’t crash land into the Black Sea, then the “kingdom of darkness ” will make corned beef dinner out of him. Also, he meant going to heavenly Jerusalem, not the Jerusalem in Israel. Why all these big shame and mess happening to us in Africa? Afterall, no prophets was raised in our own continent (Africa) and it is only a country (Egypt) that have references in the Glorious Quran and the Holy Bible.Those poeple that God used their land as sign of miracles and wonders were not crazy as our people did here. why? was that pastor, a family to Jesus? #YabaLeft is missing a patient right now.